Late this afternoon, we were reminded about why our geographic neighborhood is considered one of the most seismically active areas in the United States. A 6.5 magnitude earthquake shook our larger Northcoast region at 4:27 PM. Drew and Ella, along with Shin and Zoe, had just returned to the yurt after a swamp walk. They were in varied states of entry, inside the yurt, in the mudroom with shoes off, in the mudroom with shoes on, and outside, when shaking started. When earthquakes happen, there's a moment of pause, when one first realizes what's happening, followed by a pause to assess: should I sit tight, or vacate the building? Well, this quake shook, and then shook a little harder, then shook even more. It quickly became clear that we should leave. Hanging items were swinging, glass was rattling, and a few things were falling off shelves. I picked Ella up, and left the house, accidentally bumping her head on the doorknob on our way out. Once we got outside, the tan oak and bay trees, and garden shrubs were shaking as though giant gophers were gnawing their roots. It looked strangely windy, and I could feel the earth rolling and jiggling like jelly underfoot. A first for me! Ella got pretty scared, mostly because I was reacting a little too strongly (and the bump on her head). 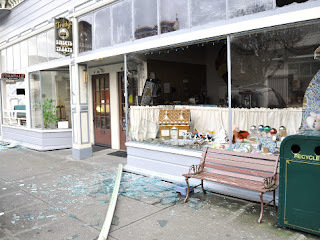 It seems those up north have lost power, and there are many broken storefront windows, but all in all, no injuries or major damage. We continue to feel the aftershocks, so much smaller as they are. 2.8's and 3.5's and so on. I think we're all hoping the big one was the main event and not a foreshock to something much larger. Fortunately, this may be our average 10 year event, which is actually 8 years overdue.